UPDATE: From The 50 Yard Line is now available for purchase on DVD. Visit FromThe50YardLine.com for details. A new independent film delivers an emotional, insightful look into the student marching band experience. The documentary From The 50 Yard Line is currently touring film festivals and will hopefully obtain broader theatrical and DVD distribution in the future. High school bands across the country are also hosting benefit screenings of the film to raise money for their band programs. The movie is already an award winner. 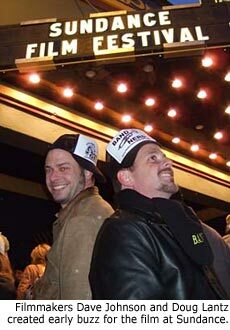 Its world premiere took place in August 2007 at the Rhode Island International Film Festival where it received the Grand Prize Audience Choice Award for Best Documentary. In September 2007 it was named Best Family Film at the Bluegrass Independent Film Festival. Director Doug Lantz has been thrilled by the initial audience response and early critical acclaim. "Many talented people have put their hearts and energy into putting this film together," Lantz says. "We believe it expresses the marching experience in a way that hasn't really been done before." The film's story revolves primarily around the Centerville Jazz marching band from Centerville, Ohio, with additional segments featuring the Fairfax H.S. band from Los Angeles, California. The two bands provide a great contrast, with Centerville boasting a long tradition and Fairfax making a comeback after 18 years without a music program. Filmmakers followed the Centerville band members for eight months, starting with spring auditions and continuing through the summer band camp and fall competition season. That extensive time with the students provided a bounty of quality footage. Some of the best moments feature students sharing from-the-heart comments about how important band has become in their lives. The power of belonging is evident when students tell their fellow members that band has helped them overcome fears and deal with life issues. The film also incorporates a broad range of perspectives from parents, judges, directors, school principals, academic professors, town mayors and more. The film is effective at bringing to light the benefits of music in education, and highlighting the budget woes that have wiped out music programs at some schools. Lantz wants a wide audience to hear the film's message about the importance of adequate funding for instrumental music programs. "We want to help communities where band programs have been cut or are suffering due to cutbacks," Lantz says. "This is something that we are passionate about." Lantz has an ideal background to bring this film to life. He was raised in Centerville and had first-hand experience as a member of the band. He is currently based in Los Angeles where his professional experience includes work at Miramax Films. His credits as a freelance journalist include ABC News, Good Morning America, Nightline, 20/20 and A&E Biography. When he began working on From The 50 Yard Line, Lantz's passion for the project spread quickly. "As I shared the message of the film with friends and co-workers, people eagerly volunteered their time and talents," Lantz says. "We soon had a production crew including a talented editor who now works for ESPN, camera ops, co-producers, a lawyer and even an animator from Disney. Everyone involved in this film was involved because they believed in the importance of instrumental music and the affect that it has on a young person's life." The team's experience is evident in the 103-minute film. This is a high-quality production, with sweeping camera shots and a perfectly synchronized score. The soundtrack incorporates both soaring orchestrations and indie rock tunes that would be worthy of a separate release on CD. The film is expertly paced, with highs and lows that will move you along an emotional rollercoaster. One moment you choke up during a kid's speech, then you laugh out loud during on-the-street interviews where non-band folks try to define band terminology. "Seeing the affect that the film has on the audience makes all of the hard work worth it," Lantz says. "One common statement we hear after every screening is 'I laughed, I cried and I learned something.'" The humor and variety broaden the film's appeal to make it entertaining for people outside of the band activity. The film takes fun, unexpected turns, such as the scene showing animals from the nearby zoo as they respond to the music. Another interesting segment is when drill designer Michael Gaines explains his craft. The corresponding video becomes a split screen showing Gaines' original computerized drill formations along with high-camera video of the band performing the same drill. From The 50 Yard Line continues to be showcased at film festivals and benefit screenings across the United States and around the world. Visit FromThe50YardLine.com for the latest news about upcoming screenings, and to sign up for email updates. According to Lantz, they started with film festivals because that circuit can reach distributors in Hollywood. "We are hoping Hollywood will take notice as we travel to film festivals and pack the theaters with the enthusiastic band family," Lantz says. The filmmakers encourage you to email and call the film festivals in your area to ask that they include From The 50 Yard Line in their festival. 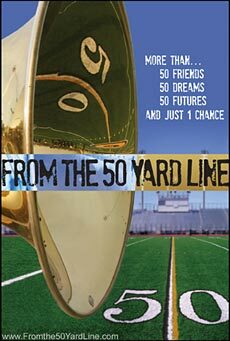 If your band booster organization would like to schedule a screening in your community to raise money for your band program, contact the filmmakers by email to let them know about your interest (find contact info at FromThe50YardLine.com).